The comparatively low cost of living was one of the characteristics that propelled Brandon to the top. 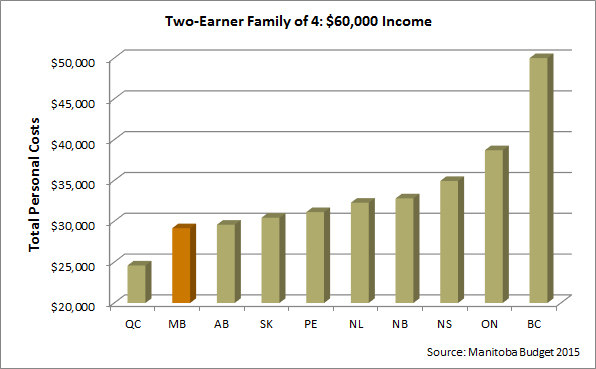 Brandon's cost of living advantage is demonstrated in the interprovincial comparisons shown below. Manitoba as a whole remains one of the most affordable provinces in Canada to live in. The Manitoba Advantage study confirms, that when compared to other Canadian Provinces, Manitoba offers residents moderate overall taxation levels, affordable housing, and low child-care, electricity and automobile insurance costs. 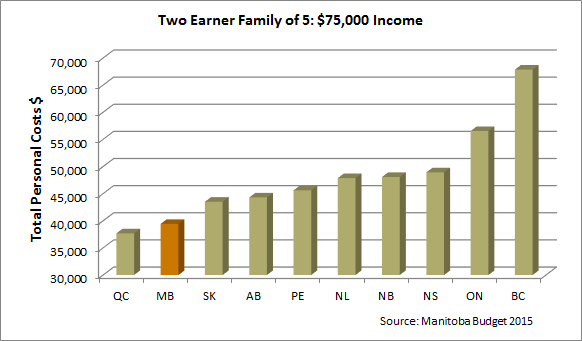 The charts below illustrate the affordable cost of living for a typical two earner Brandon family. The complete interprovincial comparison is available online. Cost of Living Brandon Snapshot. For more detailed cost of living information, see the Live or Relocation page of our website.